My Grandson at 10 deserved a new, more grown up quilt. What are your favorite colors? Yellow and Blue. It also needed to be a geometric design since numbers and shapes are the way he views the world. I was determined to use up the left overs so the backing included piano keys and extra blocks. You can see that Benjamin was delighted to have his new quilt! Terry Currie, Social Studies/6th, who is moving to North Carolina. The snowball pattern was perfect for showing off the large tennis designs. The hardest part was finding a yellow-green print to match the tennis balls. My friend, Debbie, found 2 paper pieced Cardinal patterns. The challenge was enlarging the pattern to match the 10" leaf block. I found this 10" pattern on-line to make the maple leaves. 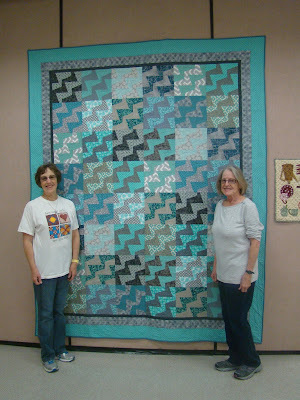 Debbie is gifted in using up scraps to make an interesting backing. 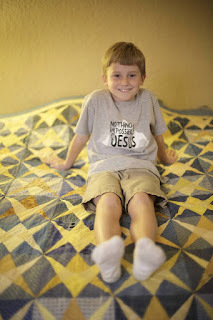 We managed to make this quilt totally from our stash and scraps. 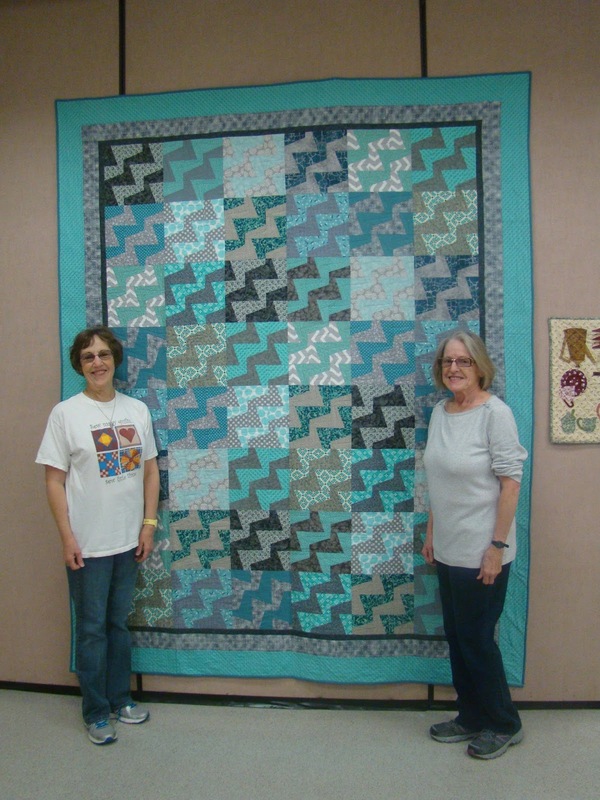 We still have a few of the original faculty that has yet to retire and more quilts to make. My grandniece, Autumn, redecorated her room in turquoise and gray and upgraded to a double bed. My sister, her grandmother, and I decided to make her a quilt appropriate for a teenager's room. I saw this Zigzag pattern in a quilt store and decided it would be easy to duplicate. It turned out to be more complex than the simple block it is based on. The block is a 9 patch with each square a combo of 2 colors cut diagonally. (Basically a "stack & wack", cut at the same angle from 2 rectangles, accounting for the seam allowance.) Each square is turned to create the continuous zigzag. There are two different block arrangements. It was difficult to keep track of the placement of the 2 blocks so the grays & turquoises matched up. We are pleased with the results and so was Autumn. 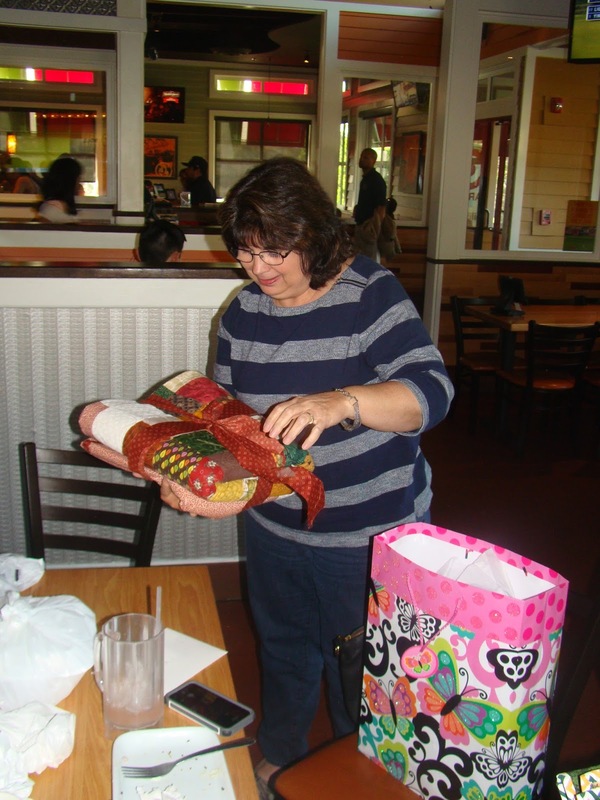 Last Christmas my quilting friends had a beige and brown exchange. We ended up with 40 6" squares, enough for a small quilt but I had a larger one in mind. I added more light, medium and dark beige/browns from my sash and my sister's to make 145 squares with sashing. 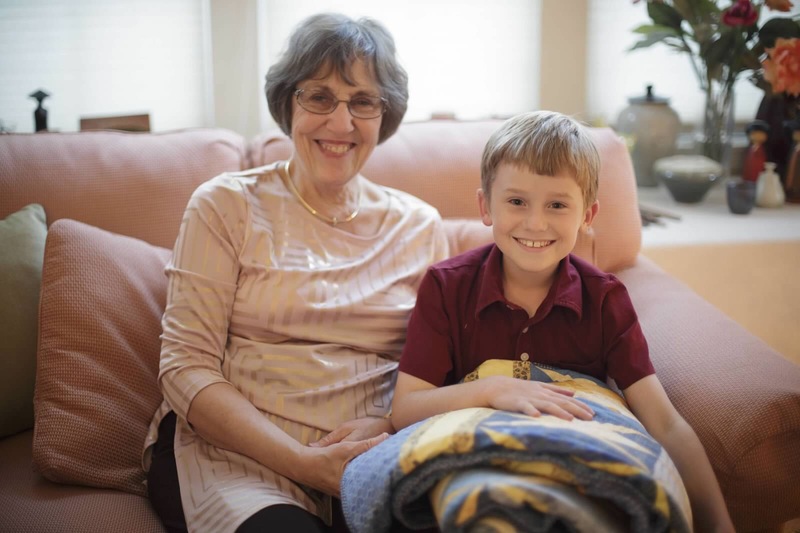 This will be another king size wedding quilt for my grandnephew. 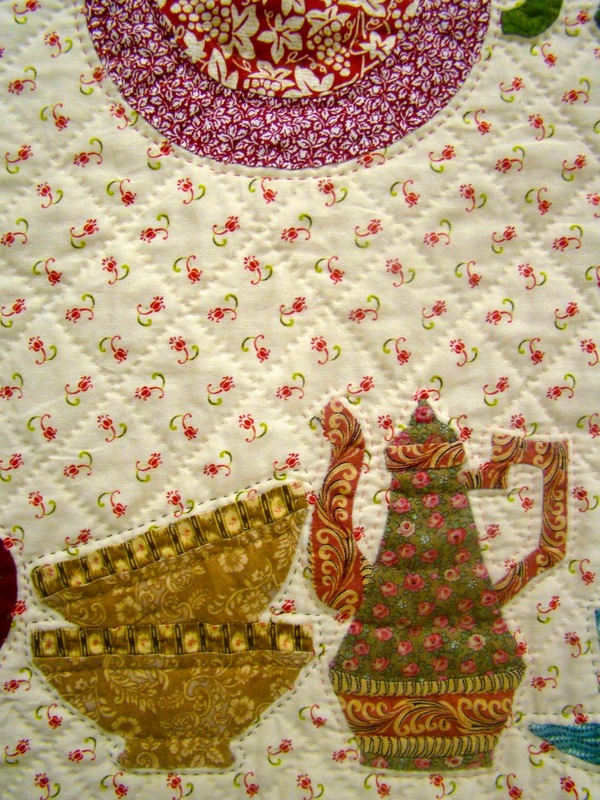 The pattern I followed ("Illusion In Neutrals" BH&G American Patchwork & Quilting, Dec. 2009, pg. 94) instructed you to sew the sashing around the square before cutting the diagonal. By doing this corners had extra seams and bulk. Knowing that I would have to be careful with the bias, I chose to cut the triangles first, add the strips and then cut the angles at the tips. The lightest combinations are arranged at the center. Moving out, combinations of lights and mediums are added next. I am now sewing medium and dark squares. They will be arranged in 2 rows all around. More to come. I'm a Grandmother for the 4th time and blessed with a perfect little girl. Each son now has 2 kids each, 2 boys for Tim and 2 girls for Andy. 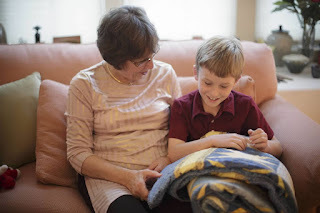 Of course I was making her a quilt while we were awaiting her arrival. 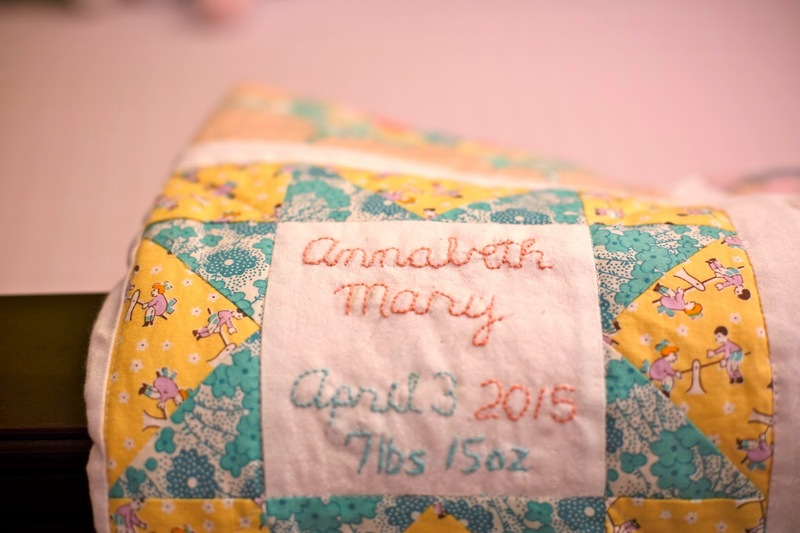 I left a space to embroider her name, weight and birth day once she came. I attend a senior class once a week. When someone wants to rid themselves of unwanted scraps or stash fabric, they leave it out for anyone to take. Most of the reproduction flour sack prints in this quilt came from those donations. They were small squares, strips and cut flowers. 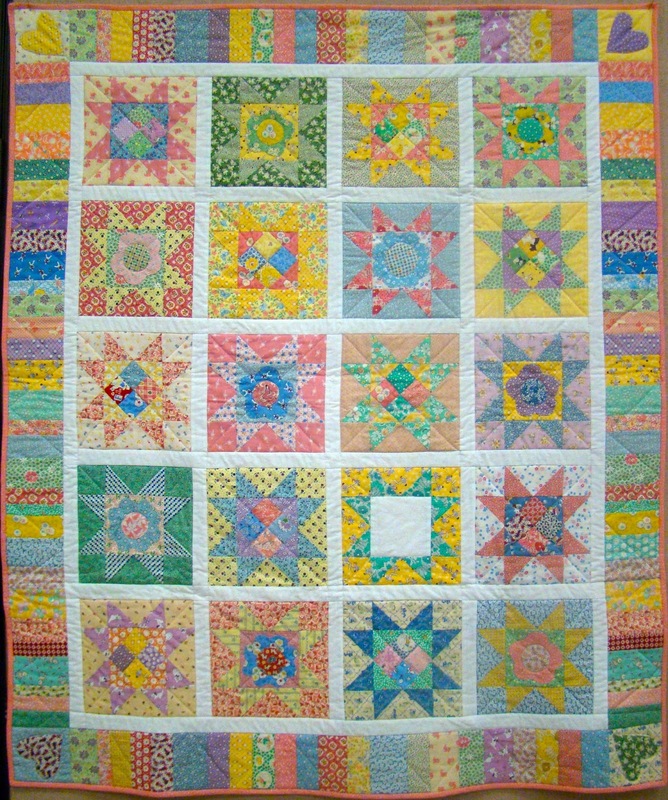 Using some of the left overs from big sister's quilt, I had enough to make this quilt. This table runner has been on my wish list for a long time. 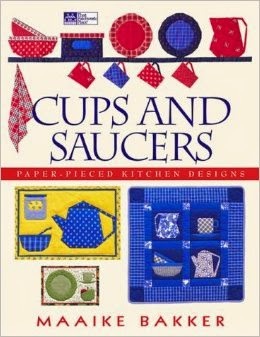 I found a quilt book Cups and Saucers by Maaike Bakker, on the SALE rack and immediately knew I wanted to use this idea. Unlike the book, I chose to applique the images rather than paper piece. I added some other images that a friend shared with me. My husband and I travel a lot, many times on a cruise. This last trip lasted for 35 days with more days at sea than in port. I planned to take this project for those restful days. Unable to bring an iron nor wanting to use that technique, I used a glue stick to tack the edges under (Tutorial). 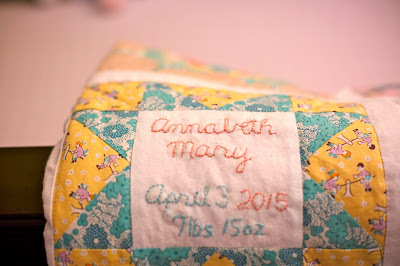 This has been a very successful and easy way to prep my applique in the past. I was able to complete both turning the edges and hand applique before disembarking. 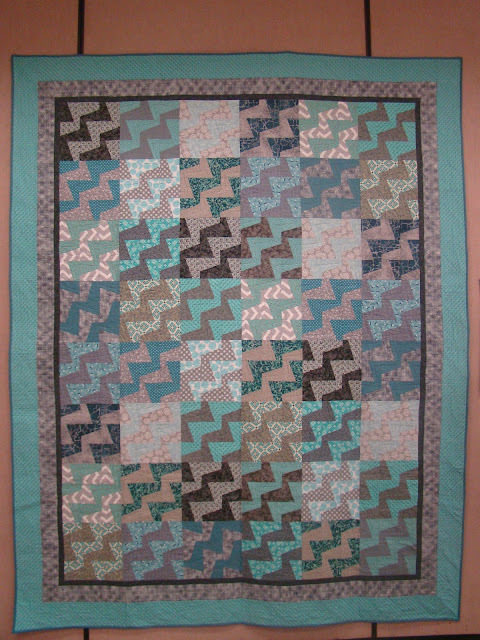 The hand quilting was done during the last month while waiting for our newest granddaughter.